As a former owner of a Legacy GT wagon, I have a love/hate relationship with the Subaru Outback. On the one hand it is a fine wagon/crossover thing, it's also the reason the Legacy wagon no longer exists in the US. My long-roof loving friends, history may repeat itself with the Volvo V60 Cross Country. Volvo will debut their V60 Cross Country at the L.A. Auto Show. They have taken the same strategy as every other manufacturer who has had a slow selling wagon. Increase the ride-height and add body cladding. Boom...wagon is now a crossover. 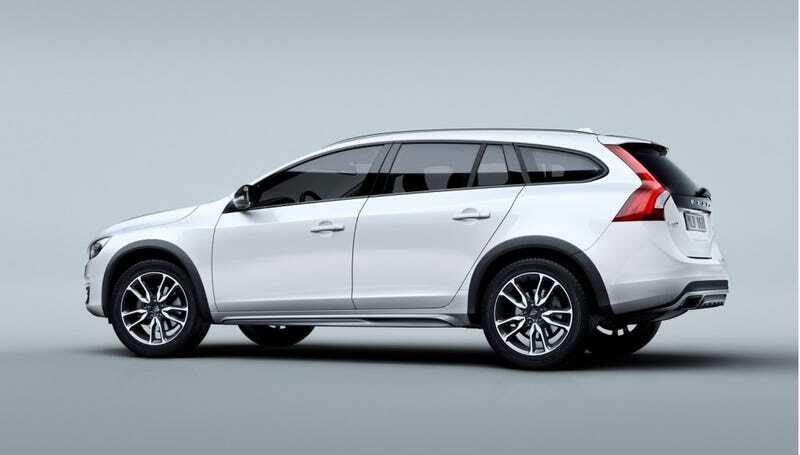 Usually the crossover variant is mechanically identical to the wagon version, but according to Motor Authority, at launch the Cross Country will be exclusively available with the Volvo's turbocharged 2.5 liter engine paired with AWD. This combination was available on the first batch of V60 wagons, but is no longer an option. So that's good news for those of you that really want the Volvo T5. Now here is the bad news, according to GoodCarBadCar.net, to date Volvo has sold a measly 4319 V60 sport wagons. They have sold over 15,000 XC60 crossovers, despite the fact that by all reasonable measures the V60 is the "better" choice. The problem with the V60 is, despite the fact it is a really good value, the cargo area is limited for a wagon and the fun to drive factor still can't match the BMW 3-series Touring. You can get V60 R-design with 300 horsepower, but that car doesn't quite live up to the Volvo R history. Now I hope I'm wrong and the V60 wagon stays with us, but knowing the history of the Legacy wagon and the Audi A4 Avant, the future doesn't look promising. The only way to sell Americans a wagon is to call it a crossover.